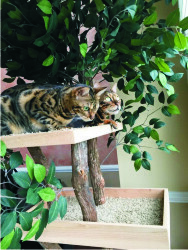 Max and his little brother Moeshe really love this tree it's become the focus of most of their activity thanks for a wonderful product! 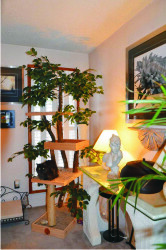 I absolutely love this cat tree. It's big. 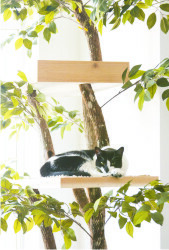 Very beautiful (dual functions as a cat tree and home decor). Assembly was super easy to follow. They had very detailed labels and even traced the log shapes so I couldn't mess up the assembly. 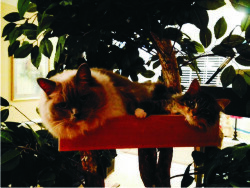 Primrose and Florian enjoying their treehouse! 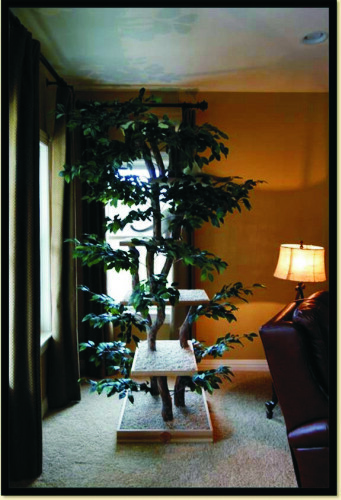 This is absolutely the best tree the critters ever owned !! Stanley , who is not in this pic , is a heavy guy and he climbs to the top without it budging. It is snowing here in Calgary, Alberta, Canada and all 3 are relaxing on each platform watching the snow fall!!! Best Quality ever , Highly recommend. The tree looks great and it's really sturdy. 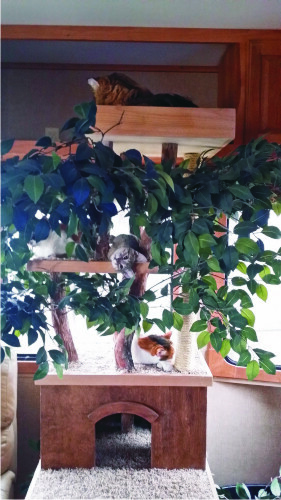 The cats were afraid to climb the old one because it was so light weight and shaky. She's running right up this one. Good Saturday morning to you! Hope all is well. Just wanted to share with you our further thoughts on our tree. We watch Ziva and Jethro run through the house and fly at the tree. First, glad it's there. 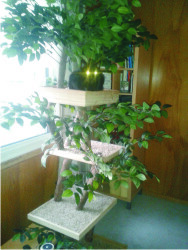 Second, no other piece of cat furniture we have had in that space would have withstood the force of the impact that 25# hurricane, followed closely by a 5# rocket. I know you build them to last, but those 2 have given us reason to hold our breath on more than one occasion. Also glad we took the time to secure it to the cabinet base. Just wanted to say thank you so much for the sturdy quality you built into our tree. We are so very grateful for it! Have a great day from some VERY grateful clients! 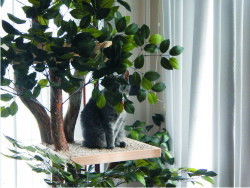 Thanks for such a finely crafted tree. I think Mr. Pants likes it. But really the tree is more for me. 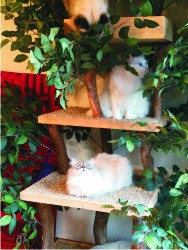 It's the best looking cat tree I've seen on the market. 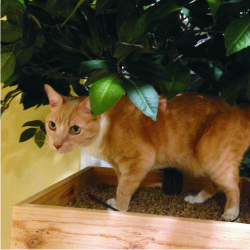 Since we put it together, we have been wanting to get you some pictures of the kitties enjoying their new tree, but snapping a perfect shot of moving fur balls is much harder than it looks! We’ll keep trying for some better pictures. Hope you enjoy!